Brunch, that combination of breakfast and lunch, is a very popular way of entertaining. I wondered what the origins of brunch were. As it turns out, there is no clear cut answer to this question. Some food historians say the roots come from England’s hunt traditions. Multi-course meals were served late in the morning after a hunting expedition. Others say the roots stem from the Catholic tradition of fasting before mass and then eating a large breakfast after mass. However brunch came into being, I think it is a great way of entertaining. Almost all the preparation can be done ahead, you get to gather with friends and family early in the day; and you get to serve cocktails for breakfast. Perfection!! Last weekend I had a delightful brunch. With a few exceptions, everything was prepared on Saturday; and I got to thoroughly enjoy my guests. This is a great choice for holiday entertaining too. 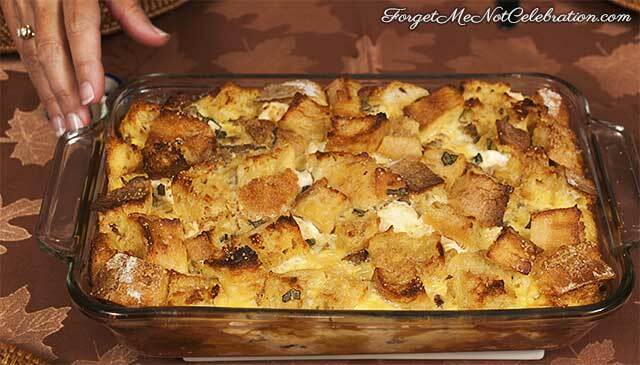 The main course was a breakfast bread pudding. The only changes that I made were using sweet Italian sausage and baking it in an 8 x 11.5″ pan. I was one of the guests. This was delicious. I am making it for a luncheon soon.